Baldessarini (Hugo Boss) will launch Strictly Private for men this coming January. The new fragrance is geared towards the "upper class man" and the "glitterati", who know the "true meaning of luxury"; Strictly Private will be fronted by actor/model Werner Schreyer. The woody oriental scent features notes of bergamot, basil, juniper, pink pepper, patchouli, vetiver, fir balsam, rose, cedar, creme brulee, vanilla and amber. Sophisticated and elegant. 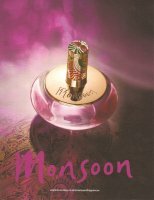 Monsoon combines top notes of Neroli and Bergamot with the delicate sweetness of lychee for an exotic fruity infusion. Fresh floral undertones of Bougainvillea Petal combined with Moroccan Rose Oil are complemented with base notes of eastern spice and hot amber oils to add underlying warmth and a sensual feel. omg I want the Monsoon perfume!!!! Hope you'll get some then! What will TH name their perfume when they come out with one? I think they have an advent calender and they just came out with a makeup set (???) so a perfume will probably be next. but I have a question- What are some perfumes that distinctly have patchouli but are floral? How about Tom Ford White Patchouli? Or one of the Angel Garden scents, or L'Artisan Voleur de Roses, among others. The first thing she tried was White Patchouli and she didn't like it. I have a Voleur de Roses sample on the way so I'll let her try that. I'm also getting Dzongkha and Timbuktu, which aren't what she says she wants but she could be surprised. Actually, I think the Josef Statkus perfume has the right list of notes, so I'll have to try to get a sample of that, too. TH is my favorite band but everyone who doesn't like them haaates them so I just type TH to avoid inciting anger. I've heard the lead singer smells really good and if *I* was a perfumer I could make him the fiercest perfume ever, but if they were to release a perfume it would probably smell like the Pirates of the Caribbean perfume that I smelled this weekend. Never heard of the band, sorry! What other fragrances does your sister like? Voleur de Roses is my new favorite juice. I've been wearing it every day since purchasing it a week ago. It's amazing stuff. I love patchouli too. I checked out the lead singer, his hair is very retro from the 80's, especially the lead singer from the Alarm. Spiked all over the place. She liked Black Orchid but not White Patchouli. Not much to go on, then…let us know if she finds any winners.